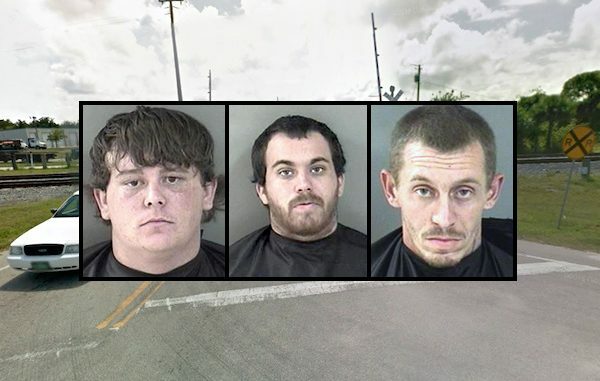 Indian River County Sheriff's Office detain three men for riding FEC railroad train. GIFFORD – The Indian River County Sheriff’s Office arrested three men for riding the FEC railroad train in Gifford, just north of Vero Beach. Zachery Ruble, 18, Connor Fuquay, 20, and Justin Carter, 28, were seen riding the train Thursday morning. At 07:15 a.m., the Indian River County Sheriff’s Office received a call from the Florida East Coast Railway about the three subjects. A freight train crew heading southbound spotted the three individuals as they passed the northbound train. Three trains were stopped while deputies conducted a search of the northbound train. Traffic was backed up in Sebastian and Micco where residents waited almost an hour to cross the railroad tracks while deputies searched for the three men. When the subjects realized the train they were sitting on was being searched, they jumped onto the southbound train. That train was stopped and searched where deputies found Ruble, Fuquay, and Carter. There is also one other pending charge, which was not posted yet. Bond set at $3,000.